The drone video, recorded in mid-April, captures the spectacular sight from above. 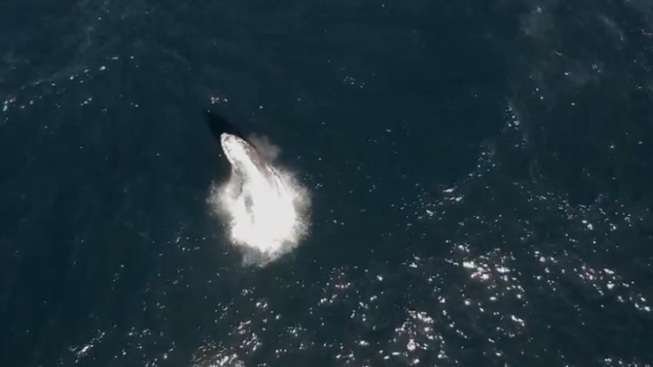 Ever seen a humpback breach from above? Monterey Bay Whale Watch took some gorgeous video of the eternal act on April 14, 2017. MONTEREY BAY WHALE WATCH, which features heart-thrilling humpback breaching from the middle of April 2017. Nancy Black, a marine biologist and owner of Monterey Bay Whale Watch, says that, at the moment, "...we estimate there are more than 60 humpback whales that just arrived in Monterey Bay for the start of feeding season. This is a relatively large number for this early in the season." What are these beautiful behemoths noshing on? Krill and "schooling fish... over the Monterey Bay submarine canyon." To see this breaching in action, the video is below, or make your way to the bay for a springtime whale-watching outing in person. May flukes, blowholes, and, fins crossed, a breach or two, be hallmarks of your trip.